We all know to keep the lawn mower in the shed when it rains or snows. But how should you care for the blade? Should you drain the oil pan? And what happens when your mower sits for months with fuel in the tank and grass buildup on the deck? 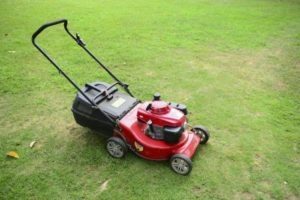 Use this step-by-step guide to ensure your lawn mower starts easily, cuts beautifully and performs better than ever come spring. Prevent an accidental engine start by disconnecting your spark plug wire, then tip the mower toward the side with the oil opening and carefully remove the blade. Check the blade for cracks. An out-of-balance blade cuts poorly, can damage the engine and should always be replaced. Sharpen the blade, removing equal amounts of metal from each side of the blade. Use a blade balance to ensure the blade is in balance after sharpening. A putty knife works well for thoroughly cleaning the bottom of the mower deck. Once all grass clumps and debris have been removed, spray the deck bottom with a corrosion protection product and put the sharpened blade back on. If your engine has a paper filter, replace it with a new one. Most foam filters, on the other hand, can be reused after a simple cleaning process—wash with soap and water, soak the clean filter in fresh oil and then squeeze out the excess. Fuel can deteriorate in as little as 60 days, causing gum and varnish to build up in your lawnmower engine. That means difficulty starting the engine, poor performance and reduced engine life. The simplest, easiest fix is using a fuel stabilizer to prevent fuel deterioration during storage. Stabilizers keep fresh fuel fresh, but won’t rejuvenate old fuel. Treat fuel in your gas can each time you purchase it. This way you know your gas is always fresh. While in storage, engine oil drains away and leaves internal engine components exposed. This results in corrosion and metal-to-metal contact (cylinder scuffing) at start-up next spring. Our recommendation is to treat the engine with a fogging oil prior to storage. Tighten loose belts. Replace any that look worn or cracked. Find any grease fittings and apply lithium grease, then lubricate other parts as instructed by your owner’s manual. Looking for more lawn equipment maintenance tips? You can learn more in the following lawnmower care and storage videos. On the backside of the STA-BIL container it states that 1 oz. treats 5 gallons of fuel. It takes me a long time to use up 5 gallons of fuel. If I mix a proportionate amount of STA-BIL in 1 or 2 gallons of fuel how critical is it if I end up adding a little more than the 1 oz. to 5 gallon ratio. Will that cause any problems with the equipment engines? Thank you. Over-treating by two or even three times the amount won’t cause any problems. Please contact us at marketing@goldeagle.com if you have any questions about this. Thank you. Hi, Can I use the Red Sta-Bil in my lawn mower ever time I gas up?